Nineteen activists who opposed ex-President Ferdinand Marcos’ dictatorship will be honored by the Bantayog ng mga Bayani Foundation on Wednesday, the foundation announced. Among those to be recognized in the Annual Honoring of Martyrs and Heroes in the People’s Resistance to Dictatorship 1965-1986 is former Senate President Jovito Salonga, founding chairman of Bantayog, who died just last March. Salonga was among those injured during the 1971 Plaza Miranda bombing in Quiapo, Manila. 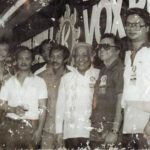 Salonga and his law firm partners also came to the defense of several detainees, including Ninoy Aquino, whom the Marcos regime arrested during the first days of Martial Law. Also to be recognized on Wednesday is renowned theater and film director, and activist Benjamin “Behn” Cervantes, a political detainee during Martial Law. Former President Marcos ordered Cervantes’ arrest because of his 1976 film titled “Sakada”, which criticized the country’s feudal power structure. Former Miss Philippines Margarita “Maita” Gomez is also among the honorees. Gomez went underground and joined revolutionary fighters despite coming from a family of Central Luzon landlords. Journalists Lourdes “Chit” Estella-Simbulan and Leticia Jimenez-Magsanoc will also be honored by the foundation for their work during the Marcos dictatorship. Simbulan first opposed the Marcos dictatorship as a campus journalist at the University of the Philippines’ Philippine Collegian. She went on to work as a professional media practitioner. Magsanoc, meanwhile, was forced to resign as an editor for Panorama, the country’s largest circulation magazine during the late 70s, after writing an anti-Marcos article. Outrage from her fellow journalists followed Magsanoc’s resignation, which sparked criticism of the late dictator’s efforts to curtail press freedom. Other honorees in the annual rites include Marciano Anastacio Jr., Eduardo Q. Aquino, Fortunato Camus, Hernando Cortez, Edgardo M. Dojillo, Manuel Dorotan, Ricardo Filio, Joel Jose, Bishop Julio X. Labayen, Romulo Peralta, Jose Aquilino Tangente, Simplicio Villados, Danilo P. Vizmanos, and Antonio “Tony” Zumel. Education Sec. Leonor Briones will be the guest of honor and speaker at the ceremony, which will be held at the Bantayog ng mga Bayani Center in Quezon City. The Bantayog Museum will also display a portion of the bullet-scarred door form Kalinga hero Macliing Dulag’s house, which is on loan from the University of the Philippines-Baguio. Government troops fired on the door while pursuing Dulag in 1980, because of his leadership of the Cordillera tribes opposing the Marcos regime.